I recently went to a breakfast where the topic of presentation at the table was Zimbabwe’s draft Income Tax bill. A bill that is, as yet, still being amended (and that most hope will be subject to a great deal more amendment before it arrives as Law). If the bill is passed, it will come into effect on 1 January 2014. As in: it will apply from then. Anyway, ignoring that little gem of irrationality, and assuming that the legislature push the bill through as is, there are some fascinating implications for the Zimbabwean business community. But I’ll get to that in a later post: because right now, this story requires some background (and the background is so interesting). Inflation is the most efficient tax collection system in the world. The government borrows a lot of money when it’s worth something, spends that money to get goods and services that are worth something, causes rampant inflation by pouring all that new cash into an enclosed system, and then pays back the debt when it’s worth almost nothing*. *It’s perhaps easiest to think of this in terms of actual goods. 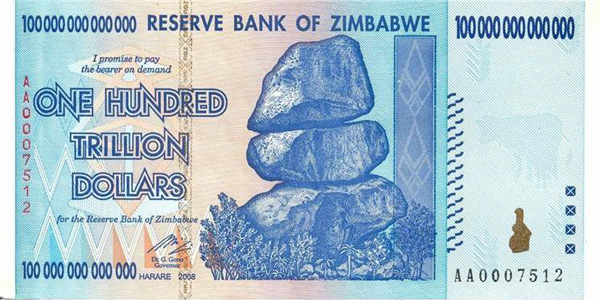 Let’s say that the government borrows 100,000 Zim dollars at a time when one Zim dollar can buy you a loaf of bread. It has basically “borrowed” the power to buy 100,000 loaves of bread. By the time it comes to repay the loan to the Reserve Bank, the price of bread has skyrocketed to 1,000 Zim dollars per loaf. This means that even though it’s repaying 100,000 Zim dollars in nominal terms: in reality, it has only repaid the power to buy 100 loaves of bread. The government’s profit from the transaction (or, rather, its income), is 99,900 loaves of bread. And you can convert that value into “real terms” by looking at it in its US dollar equivalent (price of bread in America × 99,900 loaves), or some other currency that hasn’t inflated over the same period. Inflation, when used as a tax, rapidly becomes the sole source of government revenue. You pay normal taxes in arrears: you earn profits during the year, then you calculate tax and pay it at the end. When there’s no inflation, your tax payments still have real value when you pay them. But if high inflation (or hyperinflation) has occurred during the year, your profits made near the beginning of the year will have lost most of their real value by the end. Which is unfortunate for the Revenue Collection Authorities: because normal taxes are based on nominal profits (ie. the numbers on the page), not real profits (ie. the purchasing power inherent in those numbers at the time you earned them), so the amount of normal tax paid in real terms inevitably becomes negligible. The Revenue Collection Authorities become a meaningless vestige as their role is eclipsed by the printing press. Because businesses are profit-oriented, they get in on the game. Meaning that they also try and borrow as much as possible (just like the government), and spend as quickly as possible, so that by the time they pay them back, their loans are just as negligible. Most businessfolk realise that there is more money to be made from speculation than from production. Business structures begin to erode as more time is devoted to taking advantage of the rapidly depreciating currency (or seeking to limit its impact on your operations). Workers also realise that they can make more money “speculating” than they can actually working. So production, along with most of the retail industry, collapses. The economy abandons its currency. People start to transact full-time in other currencies, or there’s a return to bartering, or (usually) some combination of the two. No more banks and credit institutions. No more factories and manufacturing firms. No more retailers and small shops. A defunct tax collection service. A government with no faith and with no way to fund itself. Some of the larger supermarket chains (the ones large enough to have had extended credit terms with their suppliers, meaning that they could sell the goods before they had to pay for them – ie. they were effective net borrowers). All the former speculators (ie. everyone else). If you started a business post dollarisation (the conversion of the economy to an alternate currency), you had the market to yourself. It was like no one had invented anything. I mean: let’s say that you started importing olive oil. Chances are, you were the only guy importing olive oil. So you could charge higher than normal prices for it. Of course, that also applied to financing. Because there wasn’t a lot of money around to extend credit, it meant that the cost of financing was Greek-default-debt-rates high. So despite the fact that the rest of the world was in recession, and that Zimbabwean prices were “regularised” into US dollars, Zimbabwe still experienced high inflation by US dollar standards (±6%) in 2009. But I’m getting distracted by the numbers. The point is: the death of a currency is apocalyptic, and the post-apocalyptic stage is a bit of a free-for-all survival-of-the-fittest he-with-offshore-financing-wins. Also, highly fortuitously for Zimbabwean businesses, it was around this time that the Marange Diamond fields* were taken over by the Zimbabwean Army. So the political factions that weren’t wrangling for political power were distracted by the wrangling over the proceeds of diamonds. *the Marange Diamond fields are estimated to hold about 25% of the world’s known diamond deposits. The rest of the economy was left to pick up the pieces and rebuild, positioning themselves in ways that would never have been possible previously. The monopolistic profits attracted new market entrants, and the increased competition caused prices to stabilise. The shops started to fill up. New restaurants started opening. People who had left the country started to return. It was all beginning to look a bit positive. Government revenue from the diamond fields turned out to less than expected. Which is my euphemistic way of saying that the proceeds from the Marange Diamond fields took on a blooded tint in the generally undeclared kind of way. *everyone had to install a machine linked to their accounting systems that fed all sales invoices directly to ZIMRA. Which is natural and expected – the fiscal authorities had to get to that point eventually.